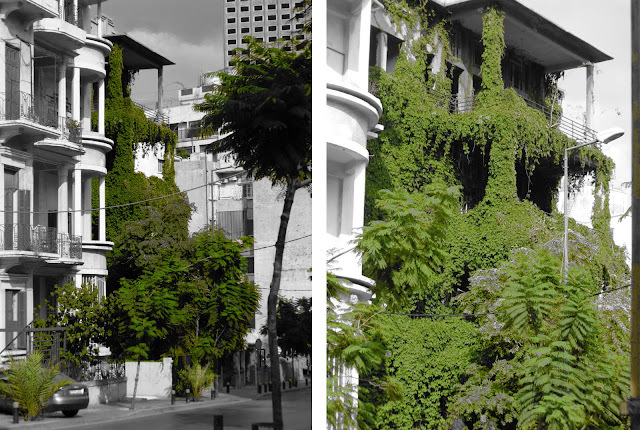 Sanayeh Beirut, Lebanon abandoned building naturally enveloped by greens! The urban environment we live in today is complex. It is hard to explain its production by using one system. 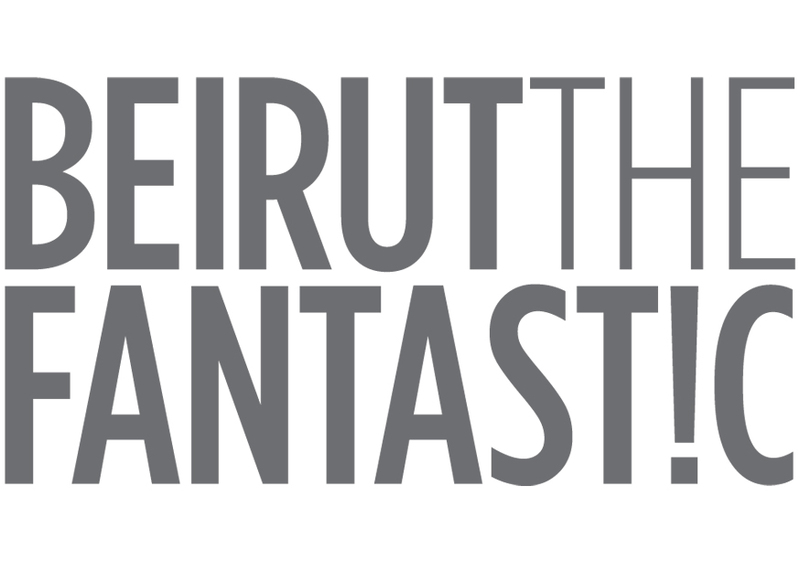 Instead, cities today, such as Beirut, are the result of layers upon layers of narratives, histories, economies, politics, building law, policies, technologies and production systems. Yet often the relationships of the layers to each other are unclear, hidden or disregarded. The systems that produce the urban environment are usually most evident in residual spaces and surfaces. 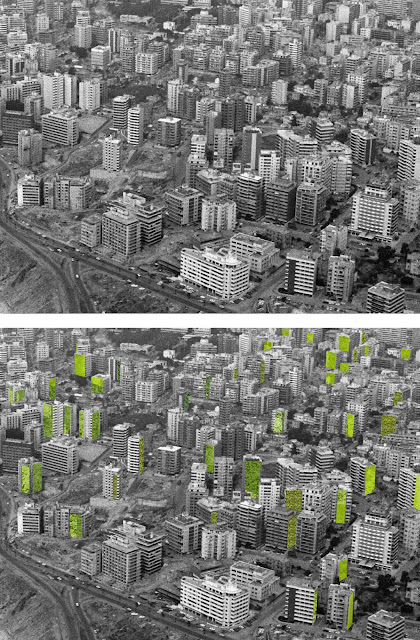 These spaces which are created as leftovers due to the multilayer that guide and produce the urban sphere. The definition of them as a mere product that are ambivalent to the city make them absent from our mental maps . They are bare, empty, untreated and most of the times if recognized are seen as undesirable byproducts. For dense cities such as in Beirut where one meter square costs about 3000$, unused surfaces and spaces provide a great opportunity for public interventions. We must recognize these residuals and embrace them. Residual surfaces in the city of Beirut are everywhere. One regular surface that can always be seen is the side wall of any built building. These walls are a result of the lack of negotiations between neighbors that the building law produced through its attempt to regulate. The building law in most urban contexts does not force any side setbacks. Developers who want to build the maximum possible do not setback from the plot sides. Therefore the side walls of all buildings on urban plots are left blank. The developer expects the neighbor to develop the site with only market intentions as well. Therefore they expect that this will also result in building up to the side plot limits thereby totally blocking the side. Therefore opening for light and ventilation are not provided on the sides as the assumption is the neighbor will block them at all times and in all circumstances during the development or re-development of the neighboring block. Varying building heights and plot development periods in addition to the varying building sections allow large parts of the blank walls to exist for over 3 years at a time around the city. Once you take notice of them you will find them everywhere. So on your next walk or drive in Beirut look up and around. This mapping of exposed blank walls challenges the notion of the building law as a ‘perfect’ organization and system of production for the urban sphere. The proposal does not critique the existence of a building law to partially guide urban production but it celebrates its ambivalence to the residual and the repetitive incidental surface. 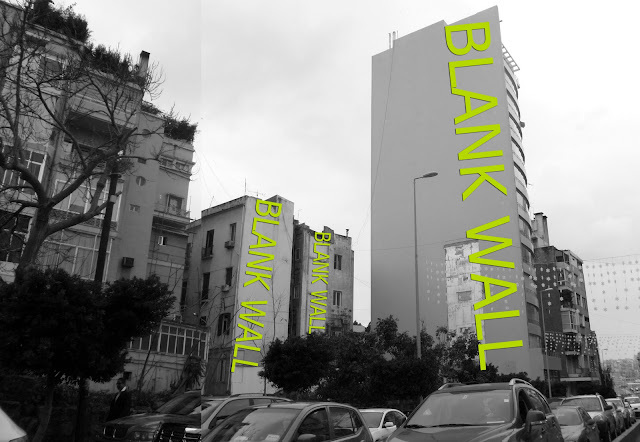 This opportunity of the blank wall found everywhere with varying exposure will be the chance for public green space to densify and exist everywhere and at all times. If in doubt of such vegetation growing without complex drip irrigation systems and major maintenance here are images of a naturally occurring overgrown deserted building at the edge of Sanayeh, Beirut, Lebanon. Planters with wires that invite the varying climbers to grow will be added to all blank walls at varying intervals. Watering systems will be designed depending on material and building structure in addition to access to water source. Small Rainwater collection plants will be placed on the building roofs to help with any water systems. 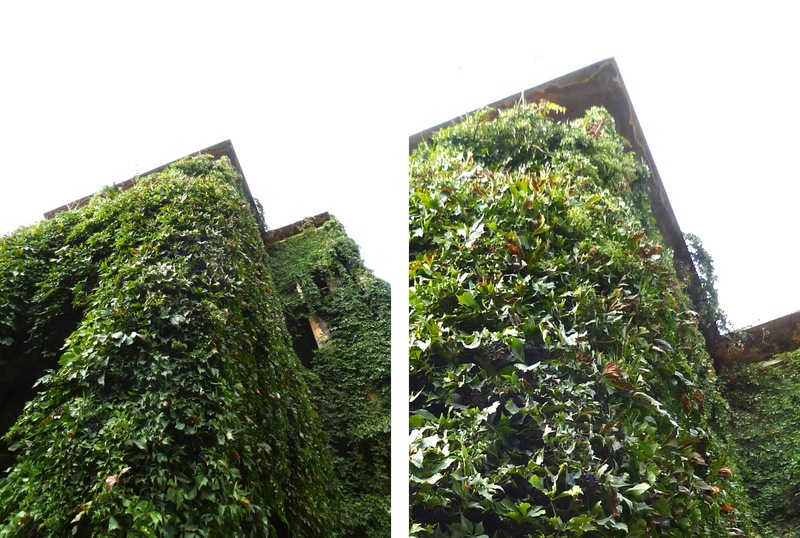 In hot climates a wall of greenery would have some good insulating qualities as well. The result is mesmerizing. What do you think? 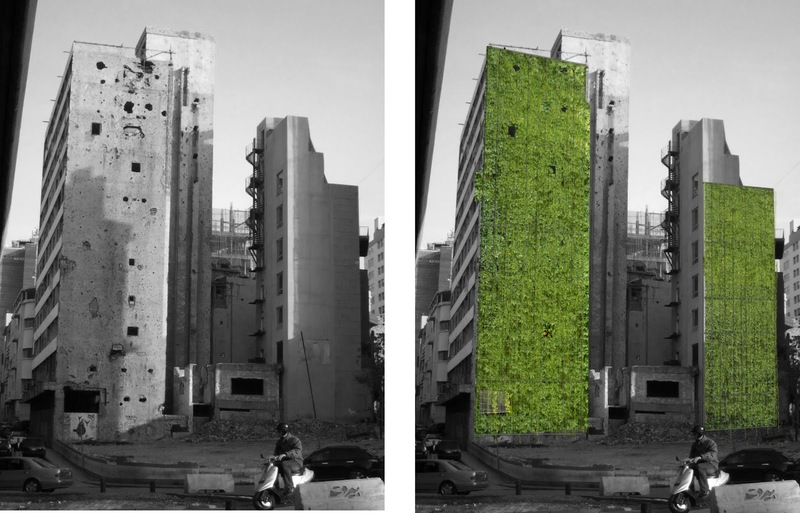 Can these walls create the green surfaces that the concrete jungle of the city desperately needs? That is wonderful! I took a pic on the 22nd of March during a research trip of the very same building....it looks NOTHING like it does now! Lots of roots growing, but i would have never expected this! Am more than happy to send the photo i took if might be useful! The photos were taken September ... was so lush and the building seemed to disappear ... I tried to find the water source but didn't. I am sure its a broken pipe or something.I would be interested if you have any information regarding that. It is amazing and a pleasure to see, sadly I have no info. I'll ask around and see what crops up. will give you more information. They grow on their own, no trees (as a tree at that height can be deadly!!!) all the local ecosystem and minimal water needed for the first two years...then no need at all!